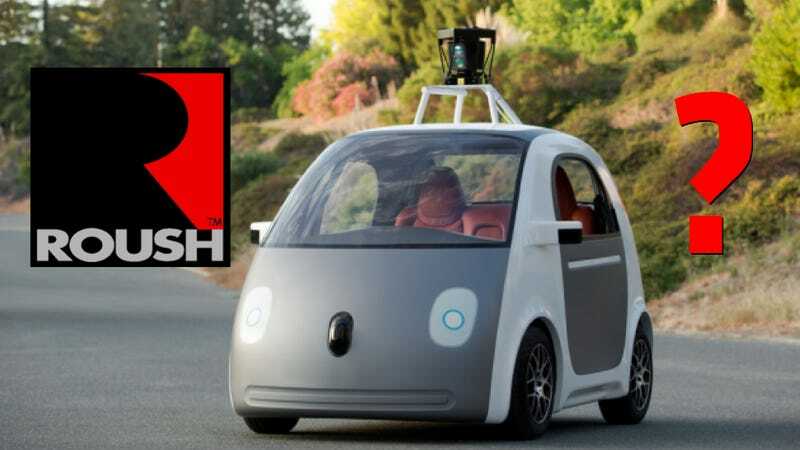 A source tells Jalopnik that Roush Enterprises is the mysterious Detroit-area company building Google's driverless car, adding to their portfolio of performance parts, military vehicles and NASCAR stock cars. Google&apos;s Driverless Car Is Built In Detroit, But By Whom? , our source says Roush is in the midst of hiring engineers for the Google project and is making interviewees sign a confidentiality agreement keeping the partnership secret. Our source also says current Roush employees have been making their way back and forth between Mountain View and Michigan as of late. The relationship is "close," this source says. According to this tipster, Roush builds the vehicles for Google at their Allen Park facility outside Detroit while Google handles the coding that makes the vehicles autonomous. Google doesn't do much with hardware — discounting their only physical forays with Google Glass, Chromebook Pixel and Project Loon — so a solid, experienced hardware-maker was needed as a partner. So why Roush? Our source didn't say, but as we pointed out — look at their portfolio. Roush makes everything from amusement park-ride parts to aircraft prototypes. We probably should have known something was up between Roush and Google when an ambassador for Google Glass hosted a Roush racing event that was livestreamed via Google+ and YouTube earlier this month. Still, all of this is based on a single source and we haven't confirmed it yet so it's possible this is incorrect. We've left messages and emails with Roush and Google and will update if/when we hear back. UPDATE: A spokeswoman for Roush writes in a text message, "I'm sorry, but it is our policy to not comment on inquiries of this nature. I suggest you direct any questions to the media group at the company about which you are inquiring." Which isn't a denial. We also hear from another source on how Google and Roush met. Google initially approached them on their strategies for electric charging station grids and that's how the conversation started. UPDATE #2: A source at Google sends us this: "These vehicles are a collaboration between the automotive talent of Michigan and the software and sensor expertise of Silicon Valley. The vehicles themselves have been assembled in a facility in Michigan — the self driving high tech parts are being assembled here in California. We are working with a number of top-notch automotive suppliers and technology companies. (We are not naming them at this point.)" UPDATE #3: Roughly an hour after our report, Crain's Detroit Business reports that not only is Roush involved, but Google has tapped "top players" in automotive safety and technology in Michigan.